Let's start with the first thing that comes to mind... Eat.Pray.Love. by Elizabeth Gilbert. Don't come to Bali looking for your own Javier Bardem. If you don't get out of Kuta, all you will ever find are drunk good-looking people perfect for flings. If you're lucky you might find people who are genuine and inspiring like the group of locals we met at Kuta Beach. Now that you have thrown out your cheesy (or sleazy!) purpose, look around and experience Bali. 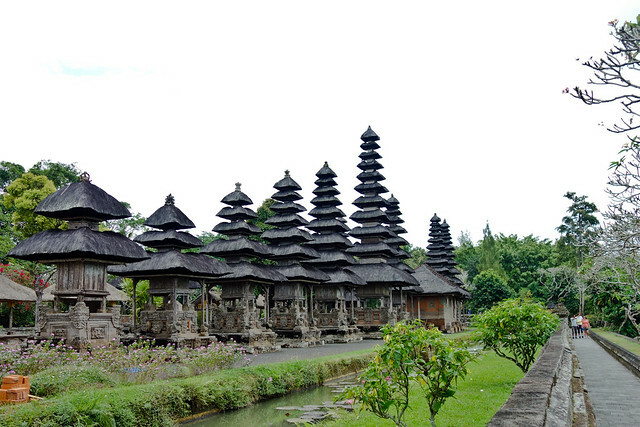 At the top of the list is visiting the temples and seeing for yourself samples of world-renowned Balinese architecture. Although the contemporary Balinese style is seen anywhere in the island, spending a couple of days to explore the houses and temples outside of Kuta is a must. It will be impossible to visit each one as there are thousands (and you can get temple-sick too), so here's a short list of temples worth seeing. 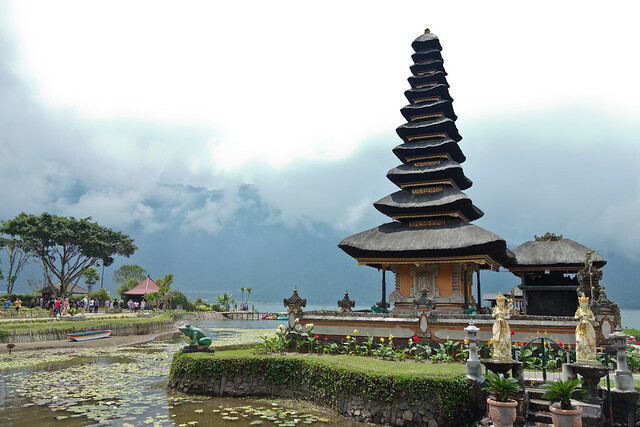 Tourists flock to Ulun Danu Bratan for the cool climate (think Baguio) and the striking location of the temple. The complex is located by the Lake Bratan, surrounded by the mountains of Bedugul. A pagoda sits on a small island, separated from the rest of the complex. Boats on the other side of the temple are available for rent for those who want to sail. Pura Taman Ayun is a picturesque complex with rows of pagodas separated from the temple gardens by a moat and a concrete wall. Do not miss the chance to watch the sunset at Pura Luhur Uluwatu. The temple is situated on a cliff side with a pagoda looking over the sea. A Kecak Fire Dance performance (a must-watch!) is held every night in time for sunset. Remember to take care of your belongings while going around the temple since monkeys are common in this area. They might surprise you on the way. My personal favorite is Pura Gunung Kawi. After a 15-min trek through rice paddies and streams, a huge stone cliff with larger-than-life carvings await. Since the site is located in the midst of rice fields, you can hear the birds calling, the sound of the river flowing, and the sound of wind chimes in chorus. 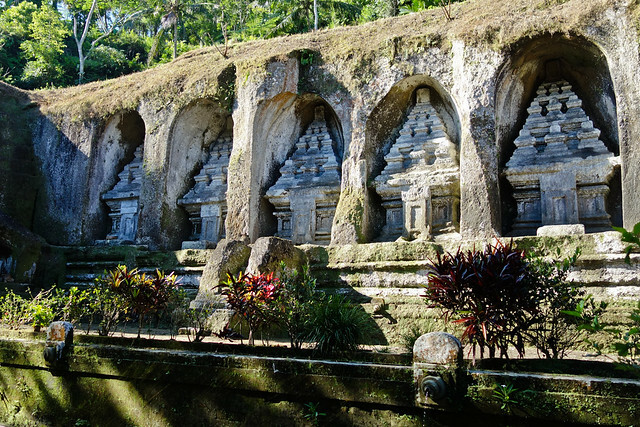 Other temples that you can visit are: Goa Gajah which features a gaping mouth as a cave entrance and Tirta Empul where the Balinese bathe in the sacred spring with intentions for good health and fortune. The best way to visit the temples is to hire a taxi. The rates are usually from 400-450K rupiahs for 10 hours (haggling included). Note that the trip would usually go beyond 10 hours (the sites are 1-2 hours away from Kuta) so do make it a point to tip the driver generously. Our driver also divided the temples into 2 areas so we spent 2 whole afternoons for the visits. Most temples also have entrance fees (usual rate at 30K IDR). Ladies on their period are not allowed to enter the temples as this goes against religious beliefs. Sarongs are also provided at the temple entrances and part of the fun is choosing a colorful cover-up. After a tiring day of visiting temples, it is mandatory to get a bottle of Bintang while you sit back and wiggle your tired feet on the sand! Coming up next on See.Hear.Explore. Bali: Life on the Beach!